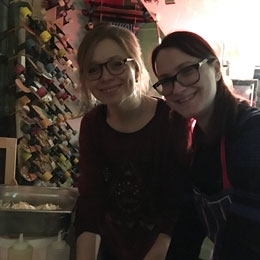 When we began brainstorming for our Christmas party this year, it quickly became clear that we wanted to do something a little out of the ordinary. 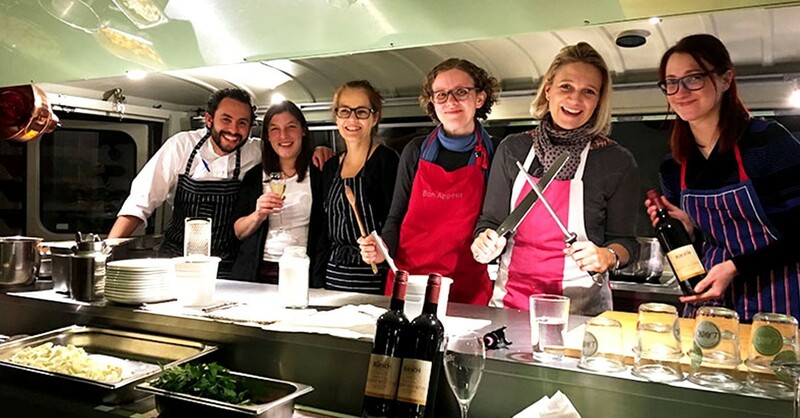 As big fans not just of foreign languages but also of exotic food, we finally hit on the idea of asking the Brazilian owner of our favourite food truck whether he would give us a cooking class. Our spontaneous request was met with equally spontaneous agreement, and shortly thereafter we received a multicultural menu that had us practically salivating with anticipation. 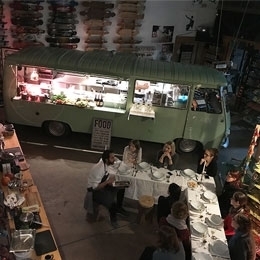 On a recent Friday, we then had the pleasure of joining José Lavor for an evening of cooking and dining in and around his food truck. 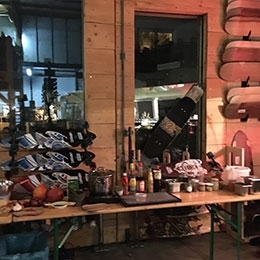 This being December, it wasn’t quite what you would call street food weather, but José had thought of everything, parking his truck inside a friend’s skateboard shop where a wood-burning stove was blazing away to keep out the winter cold. 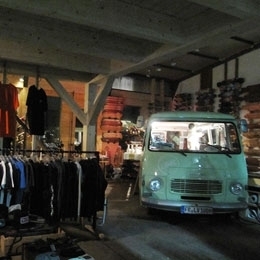 Instead of the usual kitschy Christmas decorations, the walls were hung with skateboards, and there was even a half-pipe at our disposal. 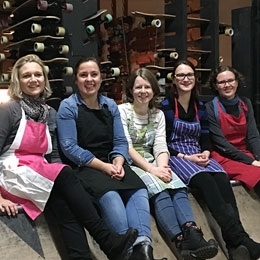 Although we opted to steer clear of the skateboards on the grounds of health and safety, we did venture on to the half-pipe to pose for a photo in our aprons. 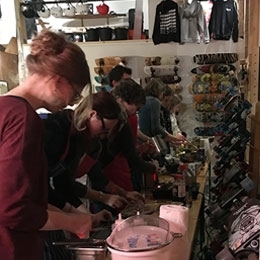 After a glass of sparkling wine and a Brazilian cheese ball or two to whet our appetites, we got straight to work chopping, stirring and kneading to an eclectic soundtrack that mixed our handcrafted pre-Christmas playlist with the rhythms of José’s homeland. 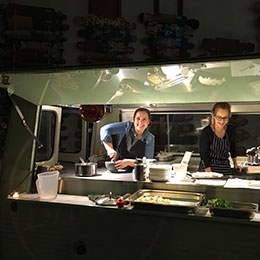 We took turns climbing aboard the mint-green truck and lending a hand with various parts of the cooking process, finding ourselves both excited and a bit daunted at the prospect of moving from customer to cook. And that wasn’t the only change of perspective we enjoyed. 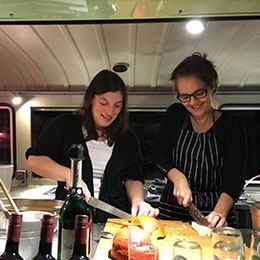 As the evening progressed, we had a lightbulb moment that we sometimes see in our own customers: in the kitchen, just as with translation, it doesn’t take long for the difference between an amateur and a professional to become clear. 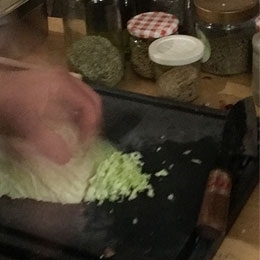 While we did a fair job of chopping the fennel, shallots and various other vegetables into bite-sized pieces, José’s handiwork – executed at the speed of light – was far more impressive in comparison. Doubtless it’s the same in every profession: solid training makes all the difference! 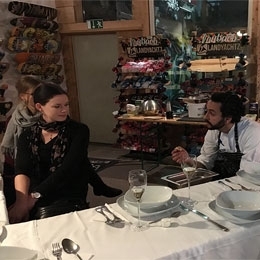 The cooking soon had our stomachs rumbling, and eventually we could hardly wait for José and his Spanish colleague Alex to dish up the fruits of our labours. We also particularly enjoyed hearing the pair communicate in their own brand of Spanish with a Brazilian flair. 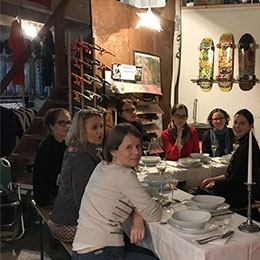 In fact, between chefs and translators, our little ensemble was fluent in a total of six languages. And the food was just as diverse. After kicking off the meal with a Thai soup featuring (both professionally and non-professionally chopped) vegetables and fish, we feasted our way through a variety of salads followed by mouthwateringly tender meat with jasmine rice and squash, before topping it all off with an apple crumble with coconut mousse. From beginning to end, everything was just as delicious as we’ve come to expect from Lavor Streetfood! 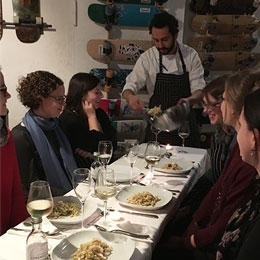 We were especially impressed by the gadget José wielded on the dessert – a whipped cream dispenser that uses compressed air to turn liquid into an airy mousse.